campy is starting to grow on my the more i build with it. 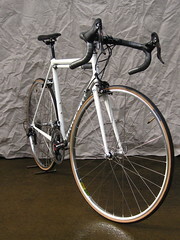 this bike turned out very nice and chris’s choice in some old stock mavic ma-2 rims really took me back. looking forward to releasing her to the wilds of california pavement. enjoy. ryan working his way through the A’s field. matt’s bunny hopping skills paid off. 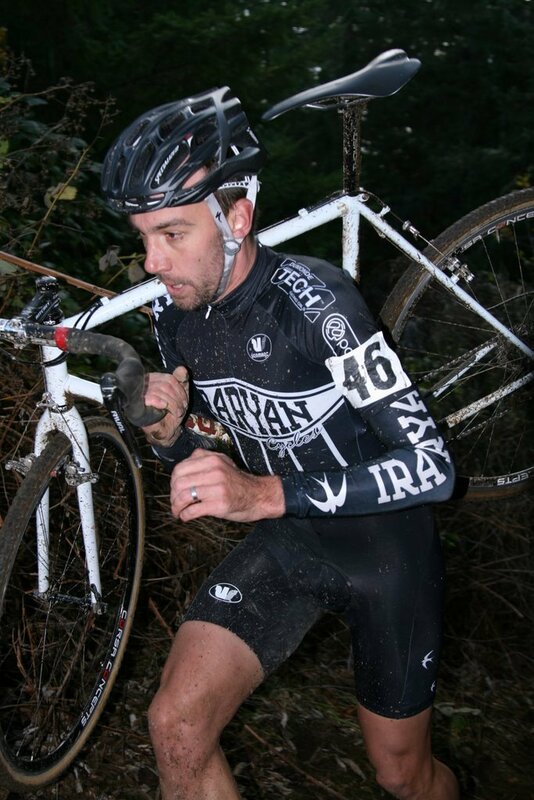 matt is an original member of the ira ryan cycles cross team and we have raced together for years. matt hall is just as skilled at riding as he is with his drawing, espresso drinking and tom waits trivia. for years matt, molly cameron and i would spend hours riding in the rain in the west hills joking about how cool it would be to put on a race on those roads. this lead to the king kong classic event a couple of years ago. thanks molly and matt. i haven’t seen a lot of matt lately since he is busy working on preparation for his art show at ampersand vintage studio in a couple of weeks. it has been over a year in the making and if you are in portland on the last thursday of feb, you owe it to yourself to go see his show. it will blow your mind. wine glass in hand on a cold and wet sunday night. cross worlds just wrapped up with victories by alberts and vos. the torch and files are tucked away for a day and i just got off the phone with michael gallager who raced at cross nationals and master’s worlds in louisville. michael is one of those guys who gets faster and more fit as the season wears on. 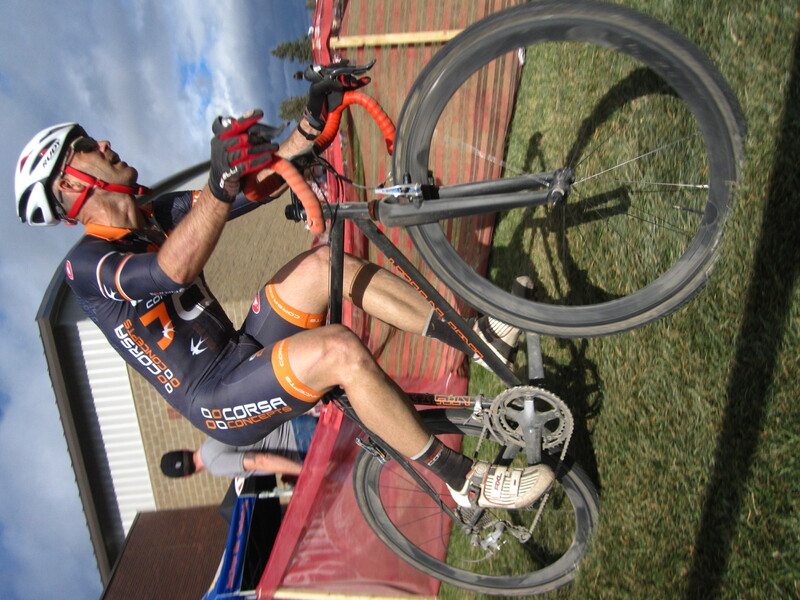 he has been racing this season for corsa concepts and campaigning on two ira ryan cross bikes. over the course of the last year i have had a chance to get to know michael and can now call him a friend. 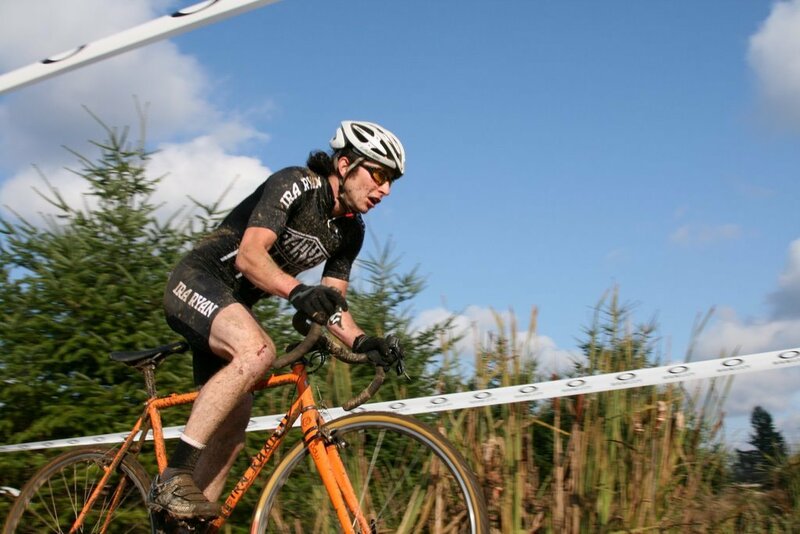 he has shown himself to be one of the most consistent and dedicated racers with a background of racing cross in belgium before coming back to portland a couple of years ago. he might not tabletop off the flyover but he is a standup guy and fast. while the rest of the cross racers i know in portland are taking time off after cross, michael was driving across the western US to sleep on the floor of a friend’s house before racing to 8th place at nationals in madison. with a third row start he climbed his way to the top of the field and rode well. 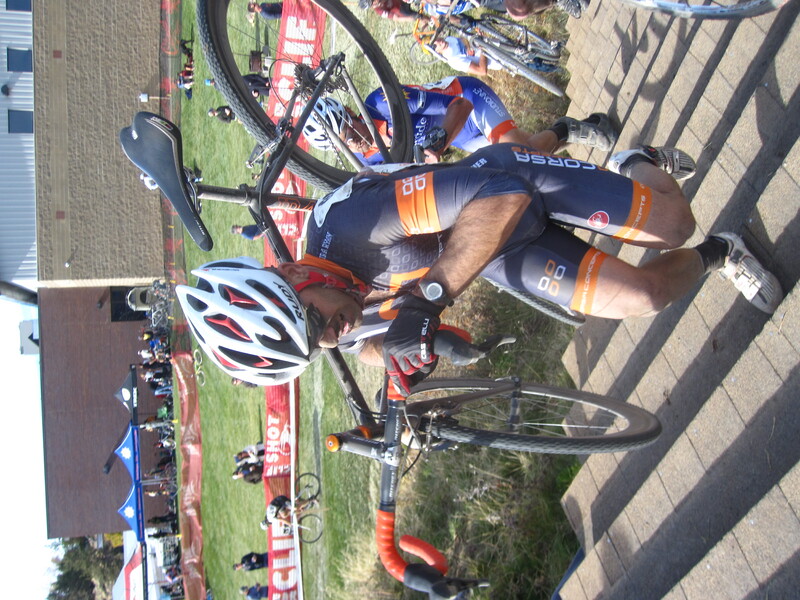 i can’t say how proud i am to have helped michael have a stellar finish to his 2011 cross season. after cross nationals micheal headed south to louisville for cyclocross master’s world championships where he got to test race the 2013 cross world’s race course and ride to 14th place amongst a stacked field. there weren’t a lot of riders from portland at master’s worlds but tim butler and michael made a strong showing for the pacific northwest. this week is all nahbs bike and prep for the show in march. very exciting but hustling for sure. eighth sign of the end days. so i finally did it. i bought a smart phone. i like to think that it’s the phone that eric zabel and mark cavendish would have used in years past since it’s a htc/t-mobile device. in the end it is making documenting and cataloging my life and work easier. rachel thinks it has stolen some of my soul and maybe it has but i had to cave sometime, right? it may be part of my new 2012 vision to work smarter and not harder. so far i think it has worked but we are only 5 days in. december 7th was my last post and it seems like so long ago that i was looking forward to some christmas downtime and not hearing about black friday. xmas blew by and rachel, myself, dan powell from pdw fame and his wife jen from jpow! cross racing fame, took a spontaneous trip to arcada, california to visit a friend, camp and ride mountain bikes for 4 days. it was glorious and dry. rachel and i work up on december 25th, put on shoes and our puffy coats and did two runs down the downhill run. followed by camp coffee and a warm fire. it was great. now i am back in the shop and in full nahbs panic mode. 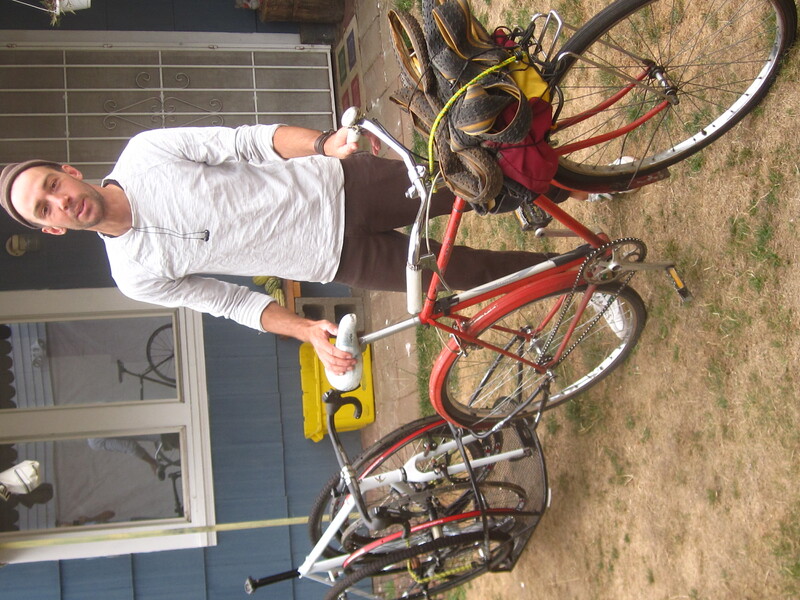 i am working on a big bike project with chris king, ned ludd in portland, trucker racks and tanner goods. it is gonna be big and beautiful and yes it will have a kickstand this time. i am excited to be working with ben at trucker and also to having a booth in sacremento. more details to follow but today i got the hubs from king which are the only front disc hubs to have funbolts in the world. they are slick. nahbs is march 2nd-4th and i hope to have everything done by then so i can enjoy some time in the sunshine in california. winding down for the year. well, sort of anyway. the bike business is still chugging along with a full head of steam as the mercury is dropping outside the shop walls. i have my little heater going but i still wear about 5 to 7 layers when i go to work. i won’t bore you with the details but i can tell you how great it is to have an arm load of merino base layers on hand to keep me warm under my army surplus sweater. i finally finished up marc’s stainless steel lugged frame and fork and i can say for certain that i will be raising my prices for polishing stainless. my fingers are nearly bleeding but damn it looks great. his bike is also getting a fillet brazed stem with a brushed nickel finish to match the brushed lugs. bling but very ridable. on the list for this week is to start the building of my nahbs bike for 2012. i am very exciting to be working on this bike with ben from trucker racks and jason french form ned ludd restaurant here in portland. i can’t go into the details but i can say it will be a truly versatile and grand bike for racing across town or picking up 50 pounds of cabbage at the farmers market. needless to say, this is the most head start i have had on a show bike ever and it feels good to have plan. plan a trip to sacramento, ca. for march 2nd to the 4th. i have been slacking on riding and i am falling off the fitness train since i ended the last cross race a couple of weeks back. while i am far from a fat framebuilder, i believe that it is important to know how the bike works at speed. would you trust a builder who doesn’t really know how a thinner or larger tube translates to ride quality? that being said, i am happy that cross is over and i have my sundays back. i have gotten out a couple of times in the last week and it has been great. cold and dry but clear and i have been able to explore a couple old routes that haven’t seen much traffic since last spring. maybe the king kong classic will make a comeback in 2012.
a little cross recap. the ira ryan cycles team had a great season and almost everyone who was racing the b’s upgraded to the faster “a” group by the end of the cross crusade series. j.pow and india both finished in the top 5 of the ladies “b” field and ryan moved up to compete with matt, rachel and i in the cut throat elite category. one last shout out to the fine folks who helped us have a great season in portland cross. portland design works provided a ton of support this year. d.pow showed early, made grilled cheese sandwiches all day and was always the last to leave. thanks pdw! corsa concepts was kind enough to let us share their tent and also build some tough and true wheels for our squad. thanks to greg and all the corsa racers for being genuinely great people! dumonde tech was always there to keep our chains and bike silent and clean. oh yeah, those ira ryan cross rigs are pretty great too. ps. i am now out of medium green t shirts for $12. i will be getting more soon but i am out for now. sorry. new little package hats should hit the shop floor just in time for christmas so stay tuned. it’s never black when the sun is shining. i am thankful that i missed the pepper spray and dodged the mobs this past week. in honor of being thankful for something besides flat screens and video games, we went on a short and dry mountain bike ride on turkey day last week before the rain started up in earnest. a short list of other things i am thankful for include my new three jaw chuck for my lathe, having plenty of 3m 314-d shop cloth and good files for shining up stainless steel, a fiance who can ride mountain bikes better than me and a group of friends who are truly stellar in portland. while i may have intentionally missed the whole shopping craze of black friday and cyber monday, it doesn’t mean i don’t want to get in on some of the action. i have a box full of t-shirts looking for homes. the new long sleeves designed by matt hall are $25 until december 7th and that includes shipping to anywhere in the lower 48 states. 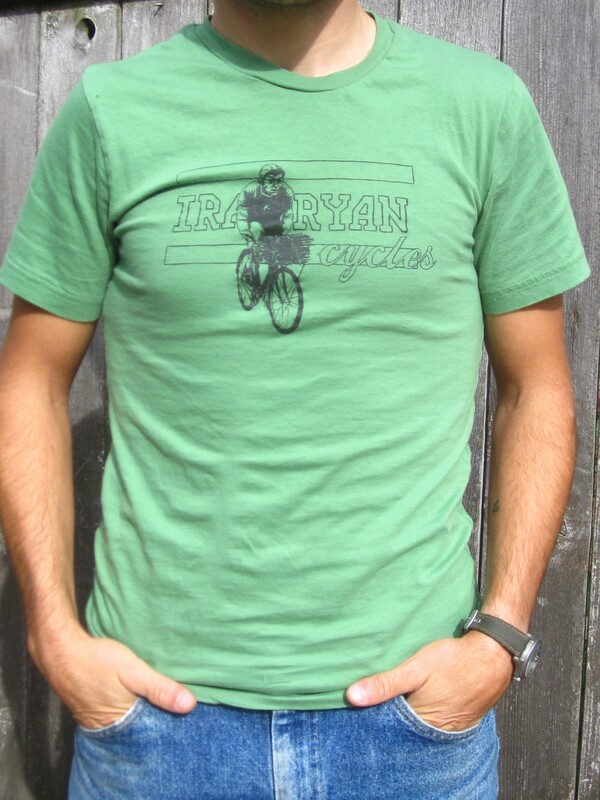 the colorful green short sleeve with the porteur on the front are $12 (shipping included) until december 7th. i have another batch of caps on the way but caroline has been busy getting ready for the bikecraft fair in portland this week and i don’t expect them to hit the shop floor for another week or so. they will be on sale for a short time when they land so stay tuned. all of these items are for sale through the link to the right and i am happy to take a check if you want to send me one with your desired goods and sizes. i promise to write about riding bikes soon and will post updates about the bikes on the bench soon. a short post to pass along part of an email from charlie in london who has been a long time fan of ira ryan cycles and also the rapha continental. thank you charlie! So how does the thing ride? OMG!!! This is without question the most beautiful ride that I have ever had. It is sooooooo comfortable, responsive, its acceleration and general pickup is awesome, and this evening commuting home I found myself riding in the bike lane on the Embankment headed west surrounded by traffic sitting up hands off bars whizzing along yet in perfect control, with a massive smile on my face. I know that I should not be using it to commute and sure I will go back to my single speed pista soon but it just gives me a huge kick to ride it, its like I become something else its like I actually morph myself into and become a bicycle. I have 8 bikes, theres the Pista, the cross, the Paris Roubaix, the crit race, the track, the mountains sportive, and French house bike, but none of them bring a smile to my face like does yours and for that Ira i thank you from the bottom of my heart – which by the way can now be found beating away in a piece of steel fashioned by you. i have been wanting to write something about the IRA RYAN CYCLES CROSS TEAM since the first race a couple of months back but alas. i have raced cross for a long time in portland and had a chance to see the scene grow leaps and bounds in the 12 years i have lived here. the level of enthusiasm in the team this year has been great and most of the people who started as b’s have upgraded and are now racing in the a’s against the local legends and regional pros. in sponsoring a team, i have always wanted to offer some support for like-minded riders who enjoy competition and want to develop their skills on the bike. i have never wanted to have a team of cutthroat athletes who will stop at nothing to win (ok, maybe a few times i have wanted that) nor a team of cyclo cross culture club hipsters who just want to drink beer (sometimes this is good too) but instead some solid folks who like to ride bikes, race to their highest potential and are genuine about making racing open to more people. we all have a lot to offer to each other whether it’s teaching someone how to rotate in a paceline or step over a barrier. we are a team of cross riders but we are roadies, mountain bikers, commuters, trackies and sometimes explorers on bicycles. we strive to ride, race, refine and develop ourselves as cyclists and show how accessible bike racing can be. the team has grown this year and i am proud to have some good people as racers and some great local companies as sponsors for the cross season. ryan king got his start in bicycle racing in athens, ga. as a founding member of the loose nuts racing team, a group of young and spirited riders based who banded together to suffer in solidarity, crush the competition, heckle the overly serious, drain beverage containers and inject some fun and life into the stodgy georgia cyclocross scene. 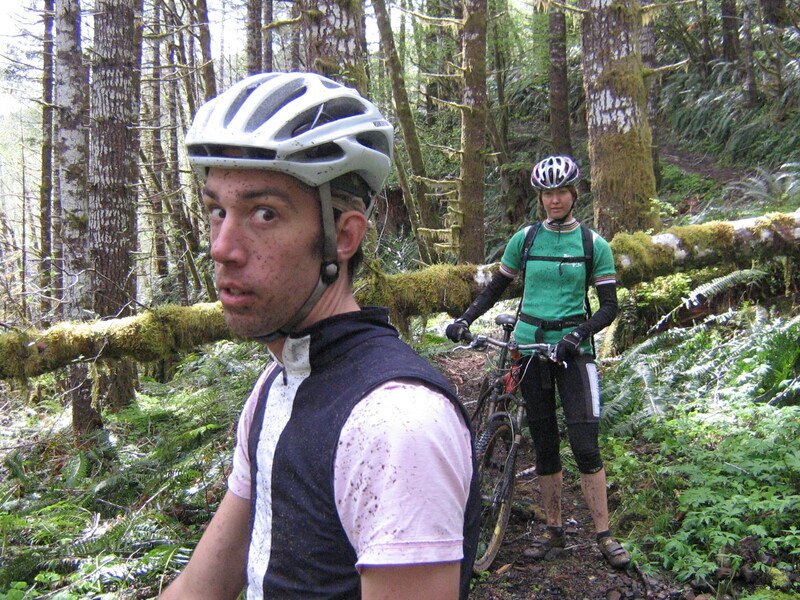 cyclocross south of the mason-dixon line has never been the same and ‘cross in the northwest still doesn’t know what’s coming. when he isn’t racing, ryan talks to cats, listens to music on cassette tapes, eats pizza and still gets a little misty-eyed when he thinks about the passing of jacques-yves cousteau. india king, 27, graduate student, transplanted to portland from georgia. 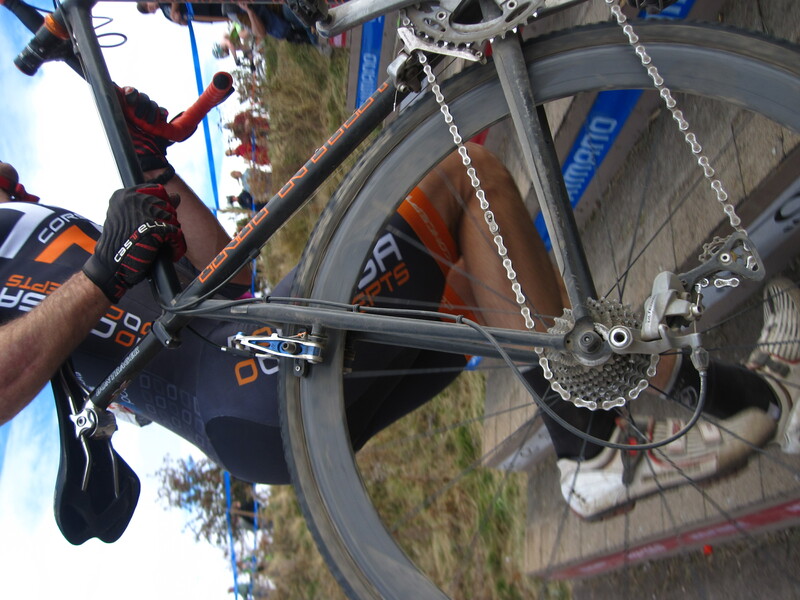 cyclocross was my gateway drug to bike racing and i got hooked. 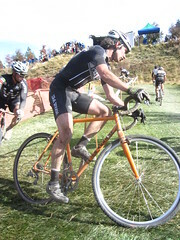 i raced one season of cross in ga. before moving to portland. for me, racing, riding, and commuting are fun as long as they do not impact my ability to eat and drink whatever i want. racing allows me the chance to push the limits of my abilities; i love the adrenaline rush at the start of each race, the ache in my legs that tells me that my body is primed and ready. i feel lucky to have found like-minded people who are willing to work hard, but make no bones about embracing other areas of their life. as a newbie to the bike-racing scene, i look forward to exploring various types of bike racing. 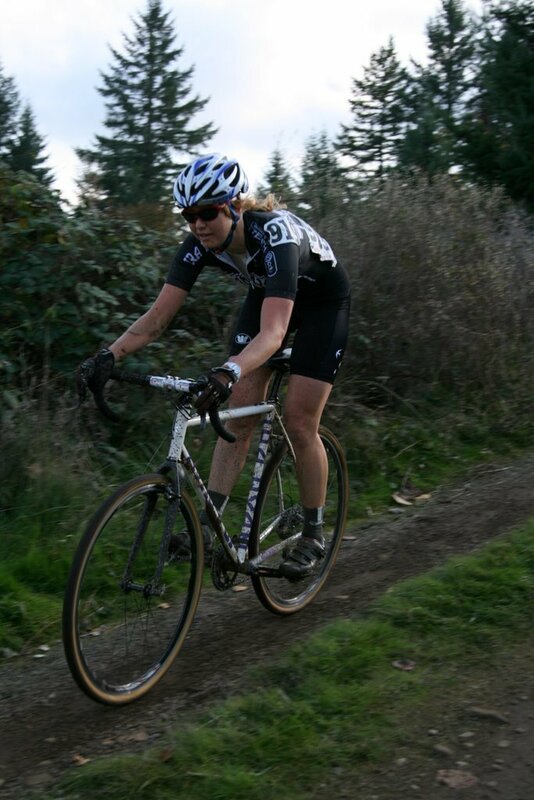 she says the main reason i started racing cross was b/c i didn’t like the imbalance between the women’s and men’s fields. i really sucked at cross and i thought that if other women saw me racing they would think “if she can do it so can i.” now i’m addicted to it. she just moved up to the women’s a field by the way. 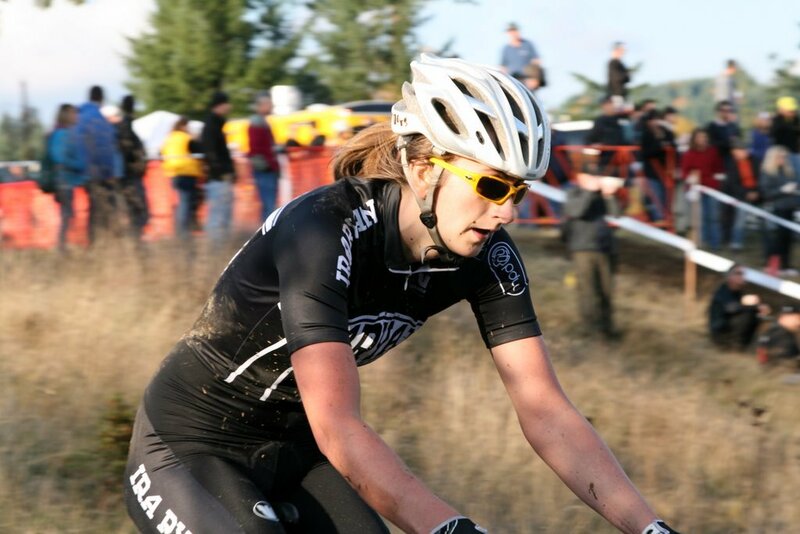 rachel bagley has raced cross for years and can sometimes be found joking about how she started cross in portland. born near the mormon belt buckle in utah, she has always loved mountains over valleys, sunrises over movies and trails over roads. 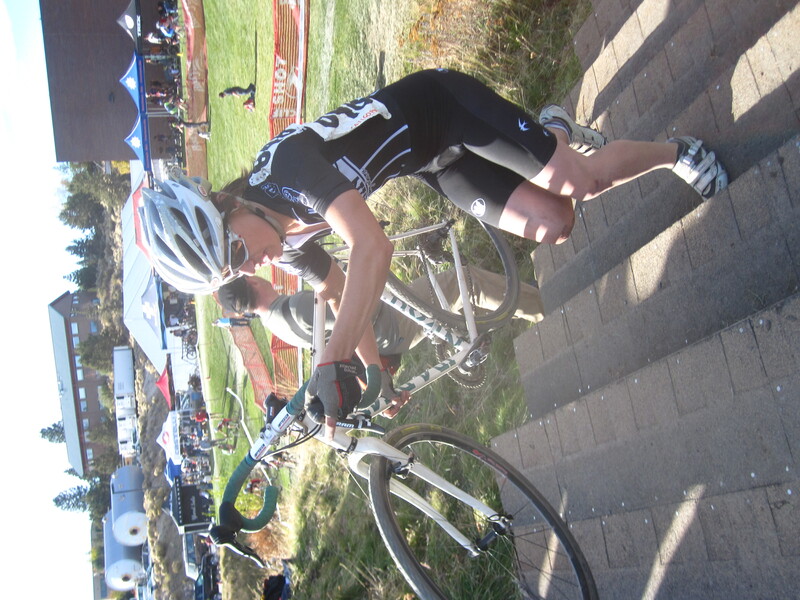 rachel moved back from south america six years ago and has since raced two cascade creampuff 100 mile mountain bike races, done a couple of road races, ridden her first double century and been racing in the ladies a field in cyclocross for a couple of seasons. her adventures can be found here. matt hall. cat lover, muse, racer, artist, legend, all round good guy. 20 years ago, matt could be found in his front yard bunny hopping empty cereal boxes that he and his brothers just polished off eating. matt left the dusty town of klamath falls for art school in portland where he found espresso, creativity and a group of people to ride with. 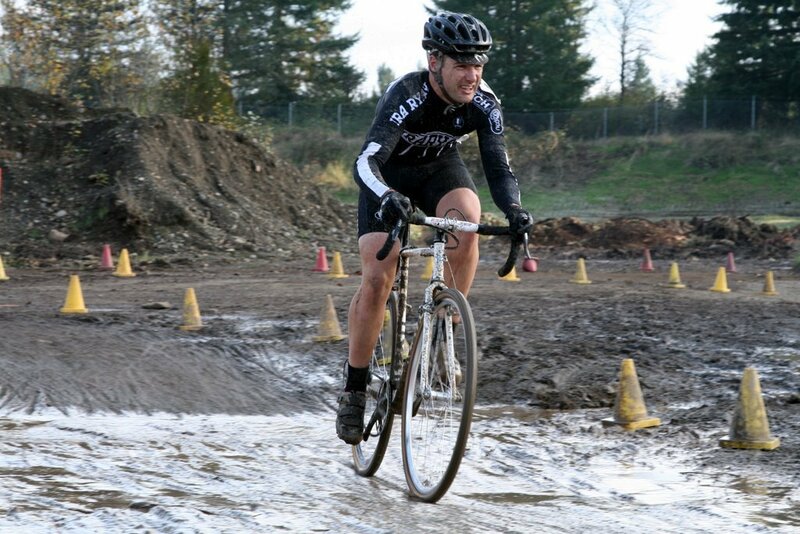 after a long career with the veloshop team, he joined the IRA RYAN CYCLES CROSS “TEAM” in 2006. i say “team” since for years it was just matt hall and myself showing up to race wet and soggy cross races. after years of racing, we finally have our own tent to hide under every weekend. matt’s drawings and artwork are amazing and some of his work can be found on his tumblr site. i also race cross when i am not working to build some killer bicycle frames but i always wish the races were about 4 hours longer. in addition to the riders, i am proud to have some great partners this year. portland design works (pdw) is a locally own company that makes the best gear for commuting and everyday riding. offering great lights, fenders and mini pumps we are guaranteed to roll dry and safe to and from the cross races this season. dan can be found making grilled cheese and coffee under the castelli tent at the local cross races. come and say hello. 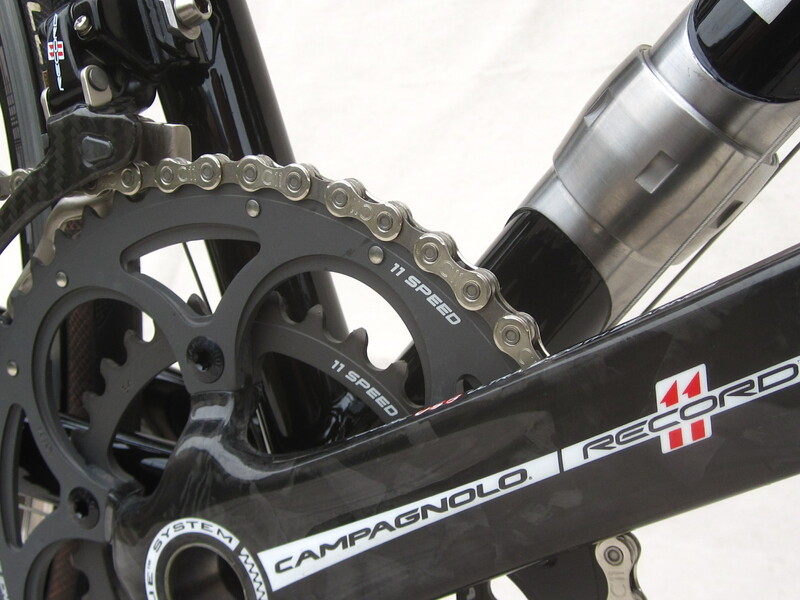 corsa concepts is another portland company that builds bicycle wheels for training and racing. with options for carbon and alloy hoops and hubs they are great wheels built by hand in the heart of the northwest cyclo cross country. these wheels take a beating and keep on tick’n. dumonde tech makes the best bicycle chain lube and even offers a coffee flavored version. weird but strangely portland. light lube for dry races, heavier lubes for wet days and the best liquid grease for rebuilding freehubs and overhauled hubs. i first used dumonde for chain lube years ago as a messenger and will never go back. 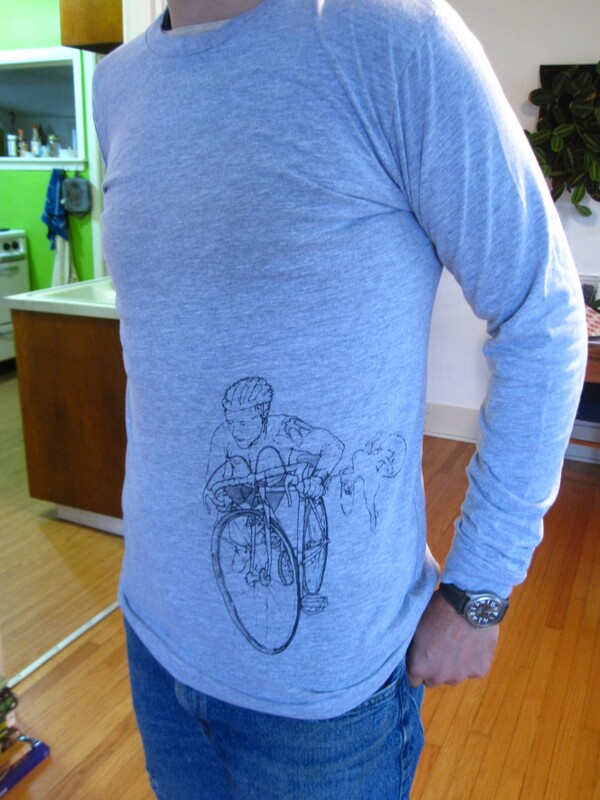 Ira Ryan Cycles soft goods. follow the adventure on twittter.